Small Surface Temperature. Cuvette, water bath, leaf and other surfaces. 24'' PFA-covered flexible wire. Stainless steel disc with epoxy back. Tubular. 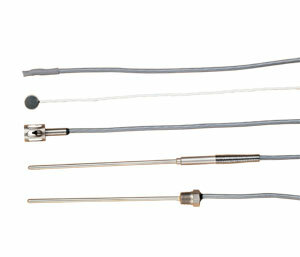 Stainless steel probe for rugged duty. Often used for liquid immersion. Probe is immersible only to tje end of the 114 mm (4 1/2'') sheath. Tubular-Glass. Chemically inert for liquid immersion use. Suitable for thermometric titration and Freezing point determination. Made with Pyrex, 5'' long. 참고: To order probes with phone plug termination add “-PP” as a suffix to part number and add $7 to price.